Figuring out what to make for dinner is always hard for me. It’s not even the act of making it, it’s coming up with the idea. If I can get something in the crockpot in the morning, I’m so proud of myself! I was having one of those days. I had a lot going on, and knew it was going to make everything else easier if I had some kind of a plan for dinner. Even if I still had to make a side dish, at least the main dish would be in the works. I have the greatest rotisserie chicken recipe that I’ve altered and use in the crockpot, rather than out on the grill where it’s intended. I spiced up my bird, turned it on high and let it go. At least for a while, planning dinner was out of my mind. As time passed and the morning turned to afternoon, the smell coming from the crockpot was constantly reminding me that I’d have to come up with something to go along with it! I was tired of the traditional mashed potatoes and gravy. I had to think up something different. I love cheese and I love potatoes. Putting them together makes them EVEN better! 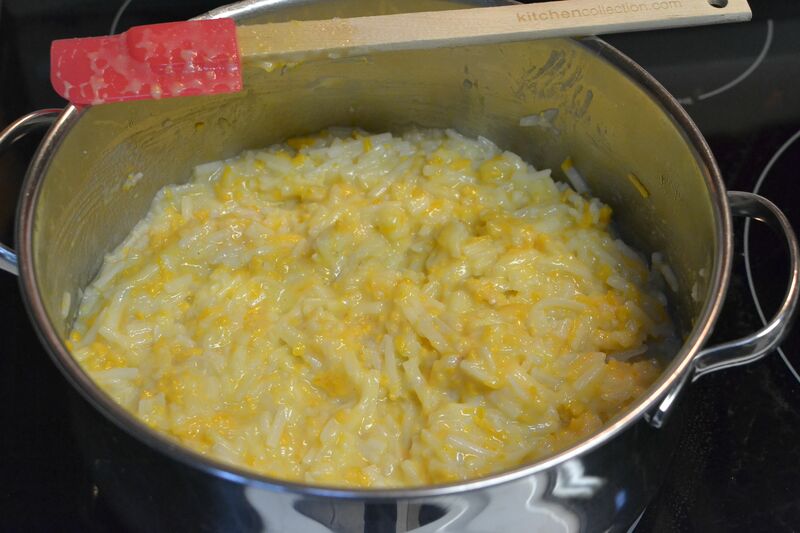 I have a delicous cheesy potato recipe that I got from my mom’s recipe box. Funny thing though, I’m not sure that she’s ever made it. Whenever there are family get togethers, I’m the one who makes and brings this dish. Maybe I’ve mastered it. Or maybe it’s just because I want to make sure that they’re at our holiday meals because I like them so much! In a skillet, melt butter over medium heat. Saute onion until tender. Stir in potatoes, soup and milk. Add cheese and 1/2 of the crumbs. Pour into a shallow casserole dish. Top with remaining crumbs. Bake at 375 degrees for 35-40 minutes. Yields 6-8 servings. I melted the butter and sauteed the onions. Yum! I LOVE the smell of sauteing onions!! While the onions were cooking, I crushed up my cheese crackers by rolling the rolling pin over them inside of a plastic, zippered bag. Man does it save on the mess! 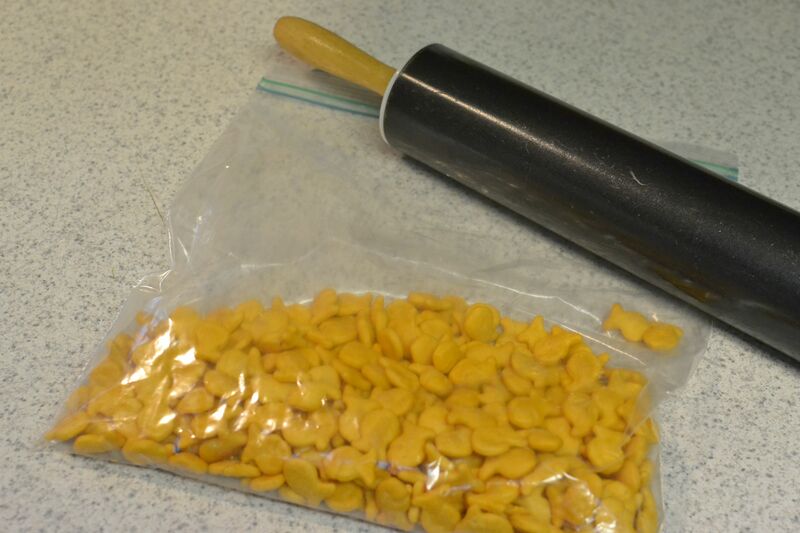 Any kind of cheese crackers will work, but I’m a mom so I always have Goldfish on hand. My boys are older now, so at least they aren’t crushed all over the seats and floor of our cars! 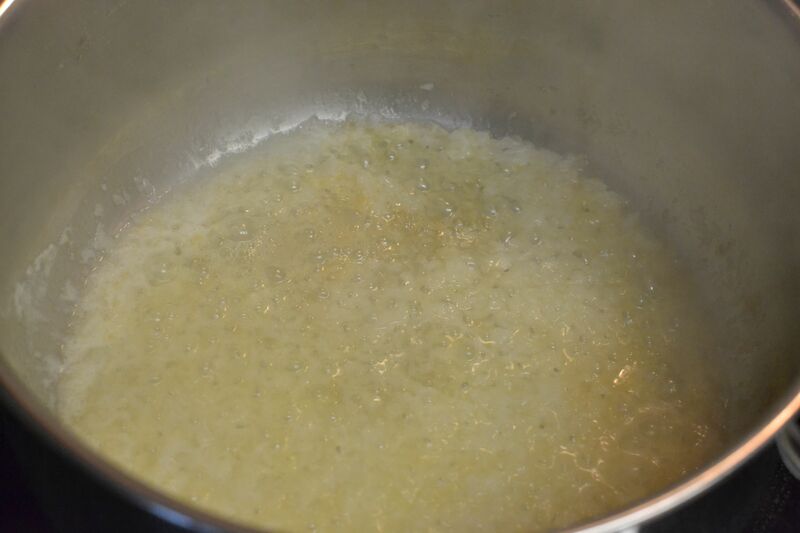 Once the onion was tender, I stirred in the potatoes, soup and milk. Then I added the cheese and 1/2 of the cracker crumbs. 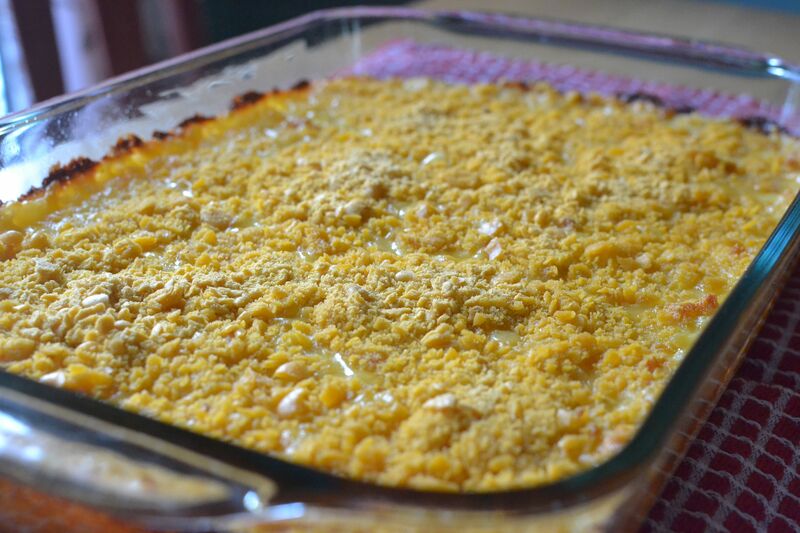 I poured my potato mixture into a 9×13 and topped it with the rest of the cheese cracker crumbs. The oven was ready to go at 375 degrees, so I popped them in. I pulled them out when the timer went off. They were bubbling and golden brown around the edges. They smelled delicious as always! 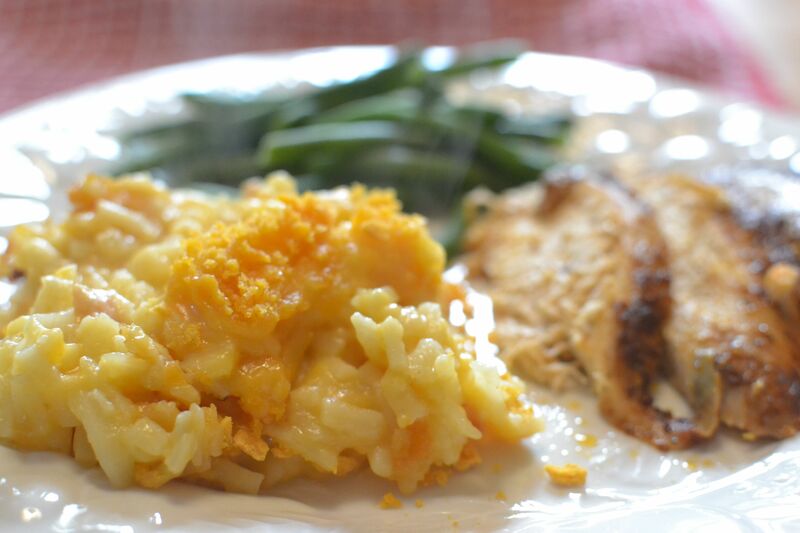 Cheesy Au Gratin potatoes were the perfect side dish to go with my rotisserie chicken! Dinner was served!! 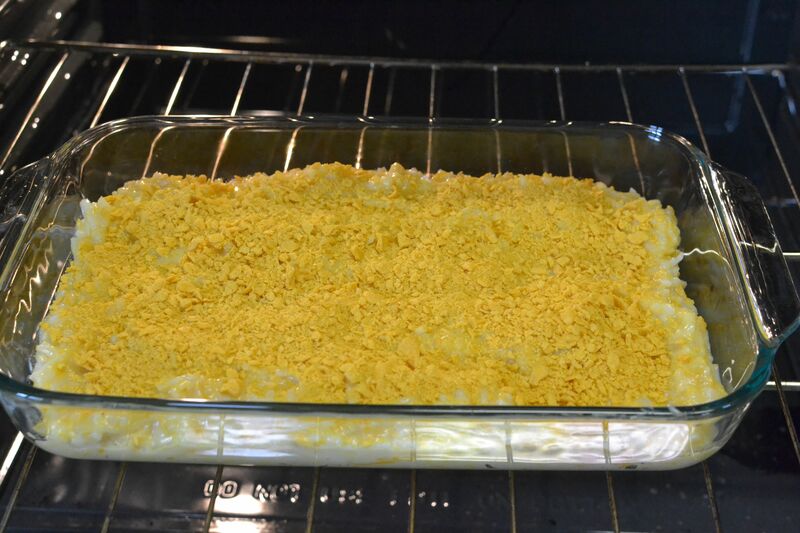 This entry was posted in bonus recipe, Side Dishes and tagged Au gratin potatoes, baking, casserole, cheese crackers, cheesy potatoes, cream of soup, hash brown potaotes, homemade, potatoes, scratch cooking, side dish by GrandmothersRecipeBox. Bookmark the permalink. Look delicious. I must try someday. Thanks Angie! They are delicious! Let us know what you think if you do try them!